Imagine a reputed Indian fashion designer ambling along one of the busier streets of a bustling metropolitan city. This couturier notices a head-turning confection in gold and cream. ‘Nice Outfit’ the designer remarks, only to realise that the outfit is question is one of his/her own creations but wasn’t purchased from his/her own studio. In a bid to solve the mystery of the ‘Nice Outfit’ that ought to have the Indian designer’s own label on it, he/she catches up to the lady in question to make some inquires. The well-trained eyes of the fashion creator immediately catch the differences in the original creation hanging at the studio versus this copycat dress. The material is cheap and tacky, the shade is slightly off and the embellishments and tailoring are of an obviously inferior quality. The lady confesses to having bought the copycat designer dress at a local boutique that specializes in making imitations of high-end designer outfits. But the worst part? The lady also happens to be a regular customer and frequent visitor at the designer’s own boutique. If imitation is the greatest form of flattery then this Indian designer should have been mighty pleased about the fact that a customer was so in love with an ensemble that she had to have it even if it was copycat fashion. However with plagiarism becoming a plague in the fashion industry with little or no support available through legal channels, this designer like many others has only one of two options. The first being legal recourse by cracking down on the local boutique that created the copycat dress and demanding they shut shop, pay damages for loss of business to the original designer or at the very least provide a guarantee to never create copycat fashion again. The second, grin and bear it or rather just begrudgingly accept that copycat clothing and copycat designer handbags are part of the business of fashion because in an increasingly aspirational society it’s impossible for even the wealthiest to shell out big bucks for designer pieces all the time so the parallel economy of copycat fashion is an unavoidable evil. To an idealist the first course of action might seem extremely appealing but there are some inherent problems in Indian and international laws when it comes to establishing that a design, motif, style, colour or fabric are entirely one particular individual’s creation. Retail giants like Zara, H&M, Forever 21 and many more have often been accused of stealing ideas or concepts from lesser known designers or labels but almost always get away with it thanks to their massive legal teams who are adept at bending already flawed laws. The most recent of these cases being a tiff between Zara and indie designer Tuesday Bassen who claims that the fast fashion brand ripped off illustrations created by her and used them on their own designs. She took to her Instagram account to show the similarities between the motifs but lost the case in court because Zara claims the artwork is not ‘distinctive’ enough to be trademarked. 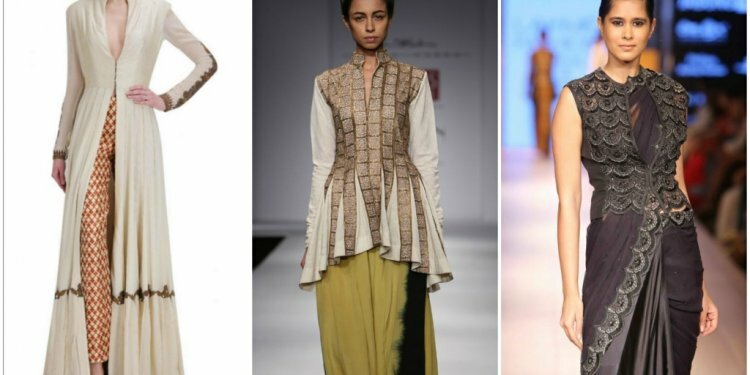 Conversely there have been innumerable cases of Indian designers creating copycat clothing by blatantly lifting creations from international fashion houses or more established Indian designers. Although trademark and patent laws have been extended to include creative elements within their scope. It’s an undeniable fact that it’s impossible to establish the difference between original and copycat fashions with absolute certainty because of their subjective and fluid nature. Which brings us to the question: What is the difference between plagiarism and inspiration in the world of fashion? The struggling and relatively unknown fashion designer rose to fame when Bollywood starlet Kangana Ranaut was often spotted wearing his creations on and off the red carpet. With his newfound fame also came allegations of copycat dresses that seemed to be completely ripped off from international labels. Rick Roy has been accused of copycat designer dresses not once but twice leading to the Indian fashion industry at large questioning if he’s an actual designer or merely a tailor that can make copies of other people’s creations? The similarities between the black Valentino gown and Kangana’s white copycat dress are too obvious to ignore or pass off as mere inspiration. But at least he changed the colour of his first copycat fashion attempt. Because the second time around he couldn’t even be bothered with that as he created an exact replica of yet another Valentino gown right down to the colour blocking. Another two-time offender is Nalandda Bhandari who was accused of copycat fashion of the worst kind because she chose to showcase both copycat dresses on the runaway as part of her collection at a reputed fashion week event. The first offence was exactly duplicating a black Marchesa dress. She was publically called out on the act by the fashion fraternity but it seems she wasn’t the kind to be once bitten twice shy and she proceeded to create a copycat dress of one of Anna Sui’s outfits for a future collection. This petite Indian designer could be given the copycat designer dresses award, with 3 offences credited to her rather illustrious name. The first is a complete copycat dress she wore herself that was originally designed by Gucci and worn by Diane Kruger. Even if the fashion police forgive the first as probably the same dress from Gucci’s line and not a forgery. The second is a shameless imitation of Gucci’s cobweb neckline dress that she merely converted into a top and sequin skirt ensemble and tried to misrepresent as her own creation. The third is a complete hack job of a Dior gown that was worn by Preity Zinta. Surily’s version included an additional silver belt and a different hue but that doesn’t take away from the glaring similarities of neckline and silhouette between the original Dior and Surily’s copycat dress. What is even worse? Preity herself wore the original Dior version at another event!